element14 recently announced the availability of the new BitScope Blade range, which enables you to power and mount multiple Raspberry Pi computers. You can use every Blade with simple plug packs, 12-V batteries, solar power systems, low-cost UPSes, and passive power over Ethernet (PoE) solutions. You can use them in a variety of ways: on a desktop, wall mounted, or in racks for large-scale deployment. Blades offer full access to Raspberry Pi I/O for displays, cameras, keyboards, expansion boards, and peripherals including BitScopes, Raspberry Pi HATs, and the Raspberry Pi 7” touchscreen display. Designed for building scalable computing solutions (e.g., stand-alone servers, private clouds, and Industrial IoT systems), the BitScope Blade is available in three editions based on the number of Raspberry Pi boards mounted. The BitScope Blade Uno is a flexible power and mounting solution for one Raspberry Pi computer and optional HAT. It is the perfect computing platform for makers, students and engineers using the Raspberry Pi. The BitScope Blade Duo is a desktop, rack or wall mountable power and mounting solution for a pair of Raspberry Pi computers, ideal for building a reliable stand-alone desktop and server system with the Raspberry Pi. The BitScope Blade Quattro is a desktop, rack, or wall-mountable power and mounting solution for four Raspberry Pi computers. It’s ideal for creating computer clusters, private clouds, or build farms with the Raspberry Pi. Elektor.Labs recently produced an Arduino Uno blueprint poster for element14. 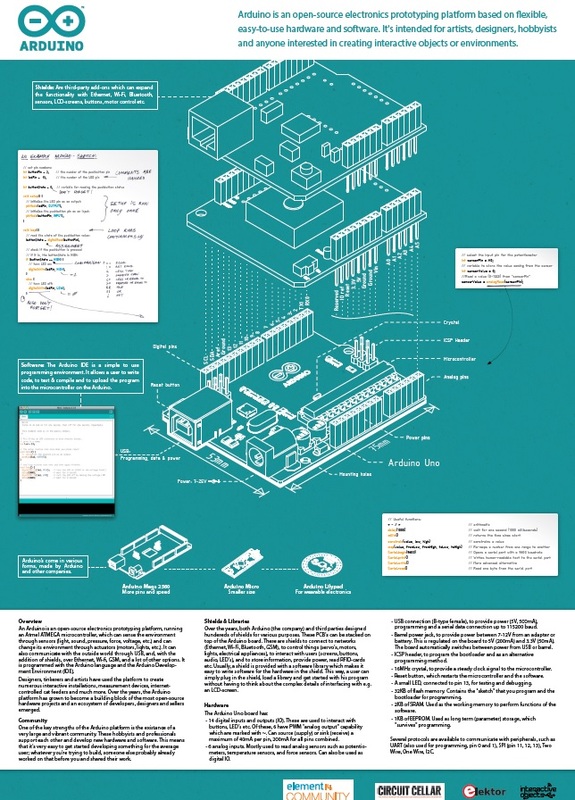 The poster details everything you need to know about the Arduino Uno. The poster also includes coding notes that will get you working with your Arduino Uno in no time. Features: The Arduino Uno is powered via USB or an external supply. It’s programmed with Arduino software. NAN: When did you start working with electronics? JEREMY: I’ve been tinkering, in some form or another, ever since I figured out how to use my opposable thumbs. Admittedly, it wasn’t electronics from the offset. As with most engineers, I started with Legos. I quickly progressed to woodworking and I constructed several pieces of furniture over the course of a few years. It was only around the start of my high school career that I realized the extent to which I could express my creativity with electronics and software. I thrust myself into the (expensive) hobby of computer building and even built an online community around it. I financed my hobby through my two companies, which offered computer repair services and video production services. After working exclusively with computer hardware for a few years, I began to dive deeper into analog circuits, robotics, microcontrollers, and more. NAN: Tell us about some of your early, pre-college projects. 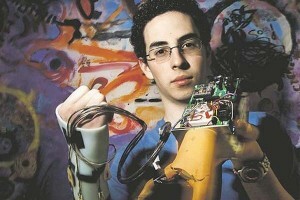 JEREMY: My most complex early project was the novel prosthetic hand I developed in high school. 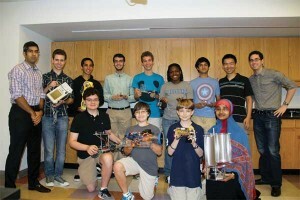 The project was a finalist in the prestigious Intel Science Talent Search. I also did a variety of robotics and custom-computer builds. The summer before starting college, my friends and I built a robot capable of playing “Guitar Hero” with nearly 100% accuracy. That was my first foray into circuit board design and parallel programming. 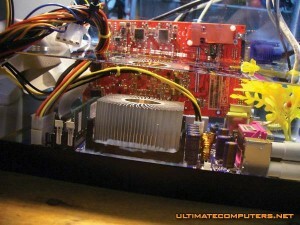 My most ridiculous computer project was a mineral oil-cooled computer. We submerged an entire computer in a fish tank filled with mineral oil (it was actually a lot of baby oil, but they are basically the same thing). NAN: You’re a recent Cornell University College of Engineering graduate. While you were there, you co-founded Cornell’s PopShop. Tell us about the workspace. Can you describe some PopShop projects? JEREMY: I recently received my Master’s degree in Electrical and Computer Engineering from Cornell University, where I previously received my BS in the same field. During my time at Cornell, my peers and I took it upon ourselves to completely retool the entrepreneurial climate at Cornell. The PopShop, a co-working space that we formed a few steps off Cornell’s main campus, was our primary means of doing this. We wanted to create a collaborative space where students could come to explore their own ideas, learn what other entrepreneurial students were working on, and get involved themselves. The PopShop is open to all Cornell students. 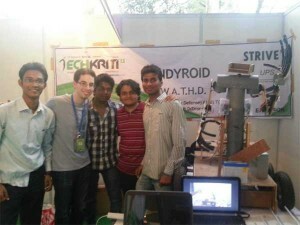 I frequently hosted events there designed to get more students inspired about pursuing their own ideas. Common occurrences included peer office hours, hack-a-thons, speed networking sessions, 3-D printing workshops, and guest talks from seasoned venture capitalists. Student startups that work (or have worked) out of the PopShop co-working space include clothing companies, financing companies, hardware startups, and more. Some specific companies include Rosie, SPLAT, LibeTech (mine), SUNN (also mine), Bora Wear, Yorango, Party Headphones, and CoVenture. NAN: Give us a little background information about Cornell University Sustainable Design (CUSD). Why did you start the group? What types of CUSD projects were you involved with? JEREMY: When I first arrived at Cornell my freshman year, I knew right away that I wanted to join a research lab, and that I wanted to join a project team (knowing that I learn best in hands-on environments instead of in the classroom). 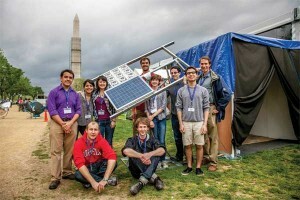 I joined the Cornell Solar Decathlon Team, a very large group of mostly engineers and architects who were building a solar-powered home to enter in the biannual solar decathlon competition orchestrated by the Department of Energy. By the end of my freshman year, I was the youngest team leader in the organization. After competing in the 2009 decathlon, I took over as chief director of the team and worked with my peers to re-form the organization into Cornell University Sustainable Design (CUSD), with the goal of building a more interdisciplinary team, with far-reaching impacts. 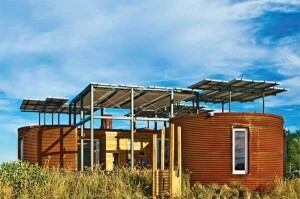 Under my leadership, CUSD built a passive schoolhouse in South Africa (which has received numerous international awards), constructed a sustainable community in Nicaragua, has been the only student group tasked with consulting on sustainable design constraints for Cornell’s new Tech Campus in New York City, partnered with nonprofits to build affordable homes in upstate New York, has taught workshops in museums and school, contributed to the design of new sustainable buildings on Cornell’s Ithaca campus, and led a cross-country bus tour to teach engineering and sustainability concepts at K–12 schools across America. The group is now comprised of students from more than 25 different majors with dozens of advisors and several simultaneous projects. The new team leaders are making it better every day. My current startup, SUNN, spun out of an EPA grant that CUSD won. NAN: You spent two years working at MakerBot Industries, where you designed electronics for a 3-D printer and a 3-D scanner. Any highlights from working on those projects? JEREMY: I had a tremendous opportunity to learn and grow while at MakerBot. When I joined, I was one of about two dozen total employees. Though I switched back and forth between consulting and full-time/part-time roles while class was in session, by the time I stopped working with MakerBot (in January 2013), the company had grown to more than 200 people. It was very exciting to be a part of that. 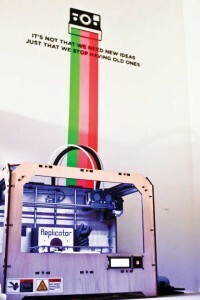 I designed all of the electronics for the original MakerBot Replicator. This constituted a complete redesign from the previous electronics that had been used on the second generation MakerBot 3-D printer. The knowledge I gained from doing this (e.g., PCB design, part sourcing, DFM, etc.) drastically outweighed much of what I had learned in school up to that point. I can’t say much about the 3-D scanner (the MakerBot Digitizer), as it has been announced, but not released (yet). The last project I worked on before leaving MakerBot was designing the first working prototype of the Digitizer electronics and firmware. 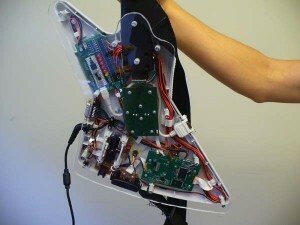 These components comprised the demo that was unveiled at SXSW this past April. This was a great opportunity to apply lessons learned from working on the Replicator electronics and find ways in which my personal design process and testing techniques could be improved. I frequently use my MakerBot printers to produce custom mechanical enclosures that complement the open-source electronics projects I’ve released. NAN: Tell us about your company, Blum Idea Labs. What types of projects are you working on? JEREMY: Blum Idea Labs is the entity I use to brand all my content and consulting services. I primarily use it as an outlet to facilitate working with educational organizations. For example, the St. Louis Hacker Scouts, the African TAHMO Sensor Workshop, and several other international organizations use a “Blum Idea Labs Arduino curriculum.” Most of my open-source projects, including my tutorials, are licensed via Blum Idea Labs. You can find all of them on my blog (www.jeremyblum.com/blog). I occasionally offer private design consulting through Blum Idea Labs, though I obviously can’t discuss work I do for clients. NAN: Tell us about the blog you write for element14. JEREMY: I generally use my personal blog to write about projects that I’ve personally been working on. However, when I want to talk about more general engineering topics (e.g., sustainability, engineering education, etc. ), I post them on my element14 blog. I have a great working relationship with element14. It has sponsored the production of all my Arduino Tutorials and also provided complete parts kits for my book. We cross-promote each-other’s content in a mutually beneficial fashion that also ensures that the community gets better access to useful engineering content. NAN: You recently wrote Exploring Arduino: Tools and Techniques for Engineering Wizardry. Do you consider this book introductory or is it written for the more experienced engineer? JEREMY: As with all the video and written content that I produce on my website and on YouTube, I tried really hard to make this book useful and accessible to both engineering veterans and newbies. The book builds on itself and provides tons of optional excerpts that dive into greater technical detail for those who truly want to grasp the physics and programming concepts behind what I teach in the book. I’ve already had readers ranging from teenagers to senior citizens comment on the applicability of the book to their varying degrees of expertise. The Amazon reviews tell a similar story. I supplemented the book with a lot of free digital content including videos, part descriptions, and open-source code on the book website. NAN: What can readers expect to learn from the book? JEREMY: I wrote the book to serve as an engineering introduction and as an idea toolbox for those wanting to dive into concepts in electrical engineering, computer science, and human-computer interaction design. Though Exploring Arduino uses the Arduino as a platform to experiment with these concepts, readers can expect to come away from the book with new skills that can be applied to a variety of platforms, projects, and ideas. This is not a recipe book. The projects readers will undertake throughout the book are designed to teach important concepts in addition to traditional programming syntax and engineering theories. NAN: I see you’ve spent some time introducing engineering concepts to children and teaching them about sustainable engineering and renewable energy. Tell us about those experiences. Any highlights? JEREMY: The way I see it, there are two ways in which engineers can make the world a better place: they can design new products and technologies that solve global problems or they can teach others the skills they need to assist in the development of solutions to global problems. I try hard to do both, though the latter enables me to have a greater impact, because I am able to multiply my impact by the number of students I teach. I’ve taught workshops, written curriculums, produced videos, written books, and corresponded directly with thousands of students all around the world with the goal of transferring sufficient knowledge for these students to go out and make a difference. I taught BlueStamp Engineering, a summer program for high school students in NYC in the summer of 2012. I also guest-lectured at the program in 2011 and 2013. I co-organized a cross-country bus tour where we taught sustainability concepts to school children across the country. I was invited to speak at Techkriti 2013 in Kanpur, India. I had the opportunity to meet many students from IIT Kanpur who already followed my videos and used my tutorials to build their own projects. 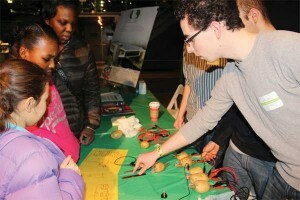 Blum Idea Labs partnered with the St. Louis Hacker Scouts to construct a curriculum for teaching electronics to the students. Though I wasn’t there in person, I did welcome them all to the program with a personalized video. 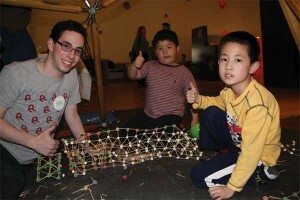 Through CUSD, I organized multiple visits to the Brooklyn Children’s Zone, where my team and I taught students about sustainable architecture and engineering. 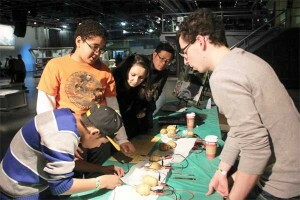 Again with CUSD, we visited the Intrepid museum to teach sustainable energy concepts using potato batteries. NAN: Speaking of promoting engineering to children, what types of technologies do you think will be important in the near future? JEREMY: I think technologies that make invention more widely accessible are going to be extremely important in the coming years. Cheaper tools, prototyping platforms such as the Arduino and the Raspberry Pi, 3-D printers, laser cutters, and open developer platforms (e.g., Android) are making it easier than ever for any person to become an inventor or an engineer. Every year, I see younger and younger students learning to use these technologies, which makes me very optimistic about the things we’ll be able to do as a society. Ready for the Pi-Face Digital? What’s that? you ask. Pi Interface Digital, or Pi-Face Digital, is a Raspberry Pi accessory board Premier Farnell will begin distributing in early 2013. You can plug it into a Raspberry Pi and start designing immediately. Plus, you can connect sensors to Pi-Face Digital for a variety of purposes, such as temperature- or pressure-monitoring applications. The following useful information is posted at the University of Manchester’s School of Computer Science site. Pi-Face Digital is the first of a range of interfaces to allow the Raspberry Pi to control and manipulate the real world. It allows the Raspberry Pi to read switches connected to it – a door sensor or pressure pad perhaps, a microswitch or reed switch, or a hand held button. With appropriate easy to write code, the Raspberry Pi then drives outputs, powering motors, actuator, LEDs, light bulbs or anything you can imagine to respond to the inputs… The hardware provides an easy and consistent programming interface, in Scratch (as shown running on a Raspberry Pi in the photograph) and Python with good observability to promote easy development, and reduce technology barriers. It will cost approximately €20 to €30. You can register at element14. Want to see Pi-Face in action? Check it out on Elektor.tv! CircuitCellar.com is an Elektor International Media publication. Want to learn more about Embedded Linux? You’re in luck. On Wednesday, November 14, Elektor and Farnell/element14 will partner to run an informative webinar on the topic at Electronica 2012 in Munich, Germany. If you’re at the show, you can attend the recordings for free. Register before October 31 to get free Electronica entry tickets from Farnell/element14. Attendees should go to the Farnell/element14 stand (Hall 5, Stand 558) for the Elektor Academy seminar, which will focus on the latest developments on the innovative Embedded Linux board. You can watch the presentation and ask the experts questions. The webinar will be recorded and webcast a bit later. Description: Benedict Sauter will take you through the design and update us on the latest applications. Visit the element14 page about the Elektor Academy event for more information and to register for a free entry ticket. Do you want to add a powerful wireless Android device to your own projects? Now you can, and doing so is easier than you think. With their high-resolution touchscreens, ample computing power, WLAN support, and telephone functions, Android smartphones and tablets are ideal for use as control centers in your projects. But until now, it has been difficult to connect them to external circuitry. Elektor’s AndroPod interface board, which adds a serial TTL port and an RS-485 port to the picture, changes this situation. In a free webinar on June 21, 2012, Bernhard Wörndl-Aichriedler (codesigner of the AndroPod Interface) will explain how easy it is to connect your own circuitry to an Android smartphone using the AndroPod interface. Click here to register. Elektor Academy and element14 have teamed up to bring you a series of exclusive webinars covering blockbuster projects from recent editions of Elektor magazine. Participation in these webinars is completely free! It’s been a remarkable week for Elektor International Media. Staffers launched a new community site, announced an upcoming Android-related webinar, and worked with U.S.-based colleagues to plan Circuit Cellar’s 25th anniversary special edition. Elektor announced this week of a new community website—Elektor Projects—for “Elektor Plus” members. Elektor Projects is a site where members can share electronics experiences, read about designs, and participate in electronics projects, games, and challenges. Check it out at www.elektor-projects.com. Build a reputation by showing of your skills in projects, contributions, comments, games and contests. Click here to join the site! Elektor staff celebrated the launch of Elektor Projects with a special cake. Any beer to go with it? Elektor announced Wednesday it is teaming up with element14 to deliver a webinar on connecting Arduino and LabVIEW using LIFA. Arduino and LabVIEW are handy programming environments for designers of all levels, especially those who do not know how to program (or don’t want to). Both platforms enable rapid application development. In this webinar Elektor editor Clemens Valens will cover how to get start with LabVIEW and LIFA. He’ll detail how to develop a virtual instrument to blink the LED on Elektor’s Arduino-compatible board called Platino. In addition, Valens will cover LIFA, add a custom relay board, and replace the USB cable by a Bluetooth connection to the PC. In the end, users will be able to wirelessly monitor the status of the Arduino/Platino/Relay system on an iPad or Android tablet anywhere in the world. Elektor Director Don Akkermans met with Elektor US and Circuit Cellar staff in Connecticut this week to discuss the various exciting endeavors on tap for the rest of 2012 and beyond. One particularly exciting development under discussion was Circuit Cellar’s 25th Anniversary Special! We’re planning an amazing 25th anniversary edition of Circuit Cellar, with essays by columnists and industry leaders on the past, present, and future of embedded design, programming, and computer technology. Elektor staffers will be among the contributors. Stay tuned for more information in the coming weeks about this must-have collector’s item! CircuitCellar.com is an Elektor group publication. CadSoft and Premier Farnell announced recently the start of the EAGLE Design Challenge, which will run until August 31, 2012. Design engineers can submit design projects for a shot at winning prizes with an overall value of around $7,000. The competition is powered by Microchip and hosted on element14. Elektor and Circuit Cellar are acting as media partners. To participate, applicants must ensure that all designs use EAGLE Version 6 and that a Microchip MCU or DSC will be integrated in the design. After registering at element14, you can submit a screenshot of your layout and add a project description on the competition page. If you don’t have an EAGLE license and want to participate in the contest, you can download a free 30-days trial version at www.element14.com/eagle-freemium. The competition will feature peer voting from the element14 community. Community members “like” entries and submit comments. 1. DELL Alienware M17x r3 + EAGLE version 6 Professional incl. all three modules. 2. MICROCHIP DV164037 Kit, Eval, ICD3 w/ Explorer-16 & DM163022-1 8-Bit development board + EAGLE Version 6 Professional incl. all three modules. 3. EAGLE Version 6 Standard incl. all three modules. Visit www.element14.com/eagle-competition for more details as well as the terms and conditions. It’s time for our weekly wrap up of Elektor news and content for Circuit Cellar members. As usual, our colleagues in Europe and beyond are always covering some cool embedded-related topics. The patch developed by the research labs Imec and Holst Centre and the Danish company Delta measures 3 ECG signals while a 3D accelerometer monitors physical activity. The captured data is processed by a microprocessor integrated in the patch and relevant information is transmitted wirelessly using the new Bluetooth Low Energy technology. Energy consumption is low enough to allow continuous operation during one week. Click here to read the entire post. The board is based on a Broadcom BCM2835 SoC, which includes an ARM1176JZF-S 700 MHz processor, a VideoCore IV GPU and 128 or 256 MB of RAM is intended to run Linux kernel based operating systems. Selling for only 28 Euros the distributors’ websites have been overwhelmed by the demand and the first batch of 10,000 pieces was sold out in less than an hour. The foundation plans to release two versions: Model A & Model B. Model A will have 128 MB RAM, one USB port and no Ethernet controller, while model B will contain 256 MB RAM, two USB ports and a 10/100 Ethernet controller. Click here for the entire article. You can also read my recent post on Raspberry Pi. Check it out! Lastly, consider attending the upcoming Elektor Academy webinar “AVR Software Defined Radio.” The webinar is scheduled for 3/29/12. Click here for more information. If you attend, be sure to let us know what you think! Circuit Cellar and CircuitCellar.com are part of the Elektor group.